Well August is done and September is looming on the horizon. For many people, the first weekend in September is Labor Day weekend, the last big beach weekend of the year. For many of us at Cape May, the dawning of September marks the dawning of another Cape May Hawkwatch season. Tomorrow, at somewhere close to 06:00am, I'll wager, Tom Reed will be climbing the steps of the Hawkwatch Platform, sweeping the skies with a trusty pair of Swarovski binoculars and - hopefully not long after - marking down the first raptor of the season. Truth be known, the weather doesn't look like it's going to send us too many raptors on the first day of the season, but tomorrow won't be about the birds for most of the people there. Tomorrow will be about reaquainting with old friends, bringing down a snack or two and just hanging out, just being there on the first day of the season. Having travelled a goodly chunk of the world in my time, I can honestly say that I know no other place that provides the birding cameraderie and good birds in the way that the Cape May Hawkwatch Platform does. If you can be there tomorrow, please do come and join in the fun. If you can't be there, we'll see you later in the season - the birds will only get better, but we're still going to have a great day tomorrow!! The 2013 Seasonal Research and Interpretive Naturalist Team with CMBO Director Pete Dunne, and Program Director Mike Crewe. We look forward to your company in the field this year. Short profiles of the team will be posted this coming week on our Seasonal Research page [photo by Rene Buccina]. Reports of a nice range of warblers continue to trickle in to the bird observatory from all directions, with recent days producing Chestnut-sided, Blackburnian, Kentucky and Connecticut Warblers among the more familiar species. With odd birds turning up at seemingly unpredictable times and locations, what's the best strategy for finding them around Cape May? Well, though a cursory glance at the sightings may seem to show a set of random occurences, reading the weather and understanding bird movements can increase your chances of hitting the right spot. 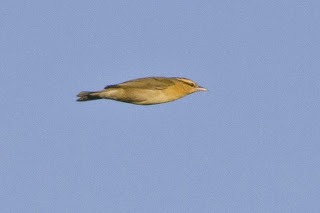 The last couple of days have produced classic examples of predictable warbler appearances for me. Wednesday started fair but the weather gradually closed in and the afternoon produced some drizzly weather. It was no great surprise to me that brightly-colored sprites began appearing in the trees around the Northwood Center at Cape May Point around the time that the rain started - why? Well, from now until early November, it is safe to assume that, for much of the time, songbirds will be on the move through our area. 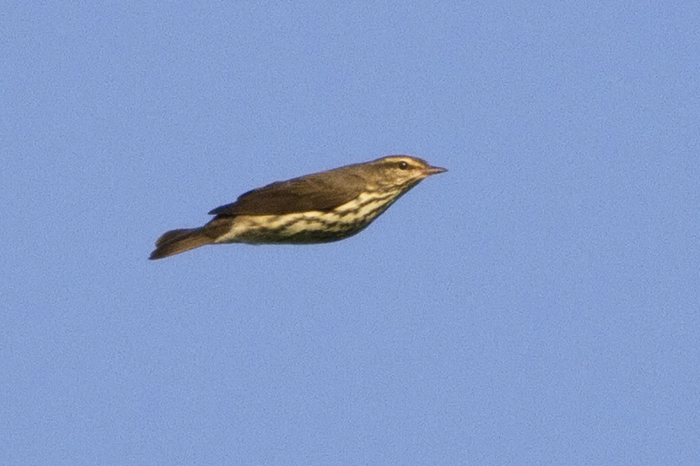 Birds heading south may continue to move throughout the day if conditions are favorable - hot and sunny weather tends to cause them to pause for a rest and to cool off in the shade, cloudy weather and calm conditions can encourage birds to continue to move unless they are strictly nocturnal migrants. Overcast, calm conditions on Wednesday morning were ideal for onward migration but, any bird doing so would have at some point flown headlong into the front that passed through and brought rain. The top tip here then is, if it starts to drizzle midday or early afternoon, head out to Cape May Point and start checking the trees for migrant songbirds. A quick look round the Northwood Center on Wednesday afternoon quickly produced 12 Yellow Warblers, eight American Redstarts, two Red-eyed Vireos, two Black-and-white Warblers and a Blue-gray Gnatcatcher, all moving through the trees in a loose feeding flock - and it had all started with the surprise appearance of a Blackburnian Warbler right outside my window. Keep an eye on the weather and keep your diary clear for next Wednesday or Thursday morning - the weather predictions look interesting, with a swing to Northeast winds after a run of Southerlies. The railing on the south side of Bunker Pond at Cape May Point State Park has a reputation for attracting an interesting array of birds, but some remain hard to get on your 'railing list'. 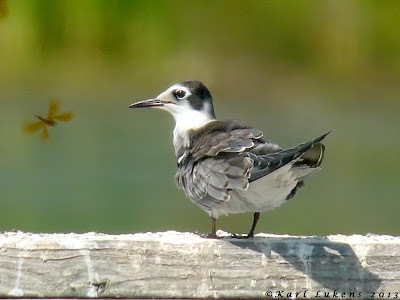 This juvenile Black Tern paused there long enough for photos and seems to be contemplating that Eastern Amberwing that is breezing past [photo by Karl Lukens]. Window cleaned, better results! The holly tree right outside my office window has earned itself a good reputation for attracting birds - this Blue-winged Warbler stopped by today to offer brief respite from a heavy emailing session [photo by Mike Crewe]. August 25th produced a skulking but well-watched and photographed Kentucky Warbler at Higbee Beach, while a check of the high tide roost at Miami Beach, Villas on 26th revealed 115 Royal Terns there. One or two Black Terns have been visiting Bunker Pond this week and Sandwich Tern and Brown Pelican were both reported from the state park on 27th. Two reports of Olive-sided Flycatchers (perhaps both of the same bird) came from Cox Hall Creek WMA today (29th). A few cooler mornings, a layer of dew on the grass and it can only mean one thing - it's time for the warblers to drop in at Cape May. The past few days has seen a nice array of fall warblers passing through the point and, though numbers are still low, variety is certainly there. Last Thursday the first fall Northern Waterthrush for my garden was tail-wagging its way along a tree branch and my office window provided me with a rather mottly-looking, molting adult Tennessee Warbler. One or two American Redstarts are pirouetting around the ivy clumps and Black-and-white Warblers are peering up and down the tree trunks. Our recent walks have certainly been getting a flavor of fall about them too; Friday's Higbee Beach walk was highlighted by finds of both Chestnut-sided and Mourning Warblers, while the evening Meadows walk produced a Black Tern, plus three Common Nighthawks feeding at sundown. 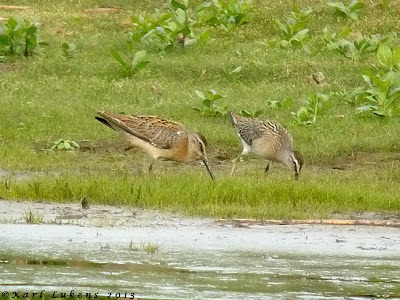 Perhaps the same three were seen feeding over the area again the following night and enjoyed by those who stopped in to look at the Wilson's Phalarope that was there on the evening of 24th. The same or another Wilson's Phalarope was at Higbee Dike this morning (25th), while other treats at The Meadows have included intermittent sightings of a Great Horned Owl and up to 300 or so Black Skimmers. The CMBO walk at The Beanery was full of goodies on 24th, including Black-billed Cuckoo, Least and Great Crested Flycatchers, two Bald Eagles and an extravaganza of Ruby-throated Hummingbirds. Sunday's walk at Cox Hall Creek WMA added to the warbler show with Northern Parula and Nashville Warbler among the mix of species. Merlins and a few Peregrines continue to infiltrate the area (two Peregrines were on the water tower at the coast guard unit on 22nd) and an early Philadelphia Vireo was at Higbee Beach on 24th. A Cattle Egret was munching grashoppers at Bunker Pond on 24th and, a little further afield, Black-necked Stilt and Marbled Godwit were at Heislerville on 23rd and a Lesser Scaup was a surprise find at Brigantine on 22nd. If you still have the impression of Eastern Willets carved on your mind after a summer on the bayshore, take a look out on the beaches now and you may notice a difference. Most of our local breeding population of Eastern Willets has already headed south and is already being replaced by Western Willets. These western birds are longer legged, longer and narrower billed and overall more graceful-looking than our local birds [photo by Jesse Amesbury]. It always pays to be cautious when identifying Willets to subspecies as there are so many potential pitfalls. 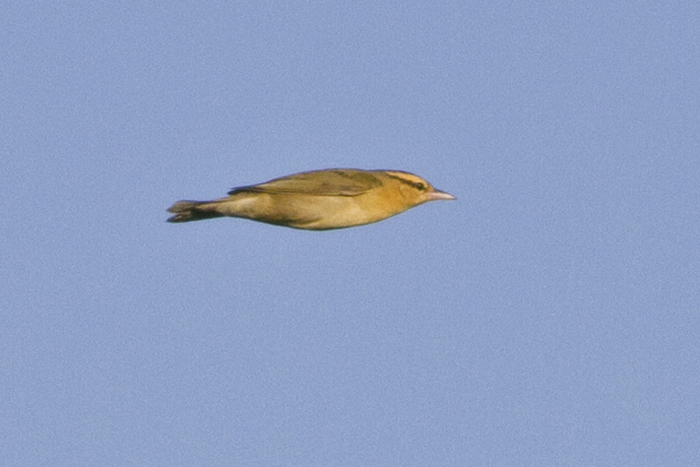 This bird was photographed toward sunset, giving it a warm, amber glow which needs to be taken into account when comparing shots. The bill on this bird looks a little shorter and stouter than the bird above, but this still apears to be a juvenile Western Willet and perhaps the bill hasn't quite finished growing yet [photo by Jesse Amesbury]. Good birding continues to get better at Cape May, as is so often the way in mid-August. Our walk at the state park this morning revealed two Northern Shovelers and two Blue-winged Teal fresh in on Bunker Pond, while two Caspian Terns kept us entertained - especially the youngster that played with a stick! Numbers of passage shorebirds continue to increase and, with water levels finally dropping now at the state park, we should hopefully get a few more things dropping in and staying for a while. A White-rumped Sandpiper was at The Meadows on 16th and Wilson's Phalarope and American Golden Plover continue at Brigantine. 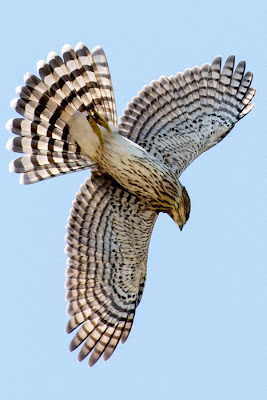 The first Sharp-shinned Hawks and Merlins have been noted in both Atlantic and Cape May counties over the past few days and herons and egrets are certainly on the move, with several reports of American Bitterns from a range of sites recently. Songbird passage continues to pick up, with Eastern Kingbirds building up in number at Higbee Beach WMA and a few early Bobolinks starting to bound over the point. Warblers will only continue to increase - both in number and in variety - over the next few weeks; Michael O'Brien reported a fly-over Cape May Warbler on Stevens Street on 20th, while Sam Galick's posts on our Seasonal Research blog will keep you up to date on the great variety of warblers that are passing Higbee Dike (as well as keeping you up to date on Atlantic City Airport flight schedules and the latest puppy news it would appear!!!). 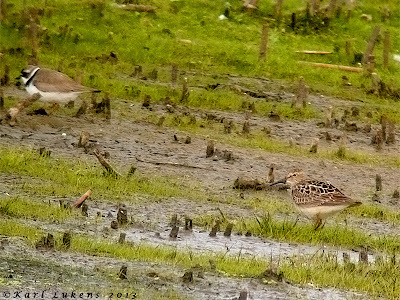 Locally, shorebird variety has been best at The Meadows so far this season - here a Semipalmated Plover shares space and time with a Pectoral Sandpiper [photo by Karl Lukens]. 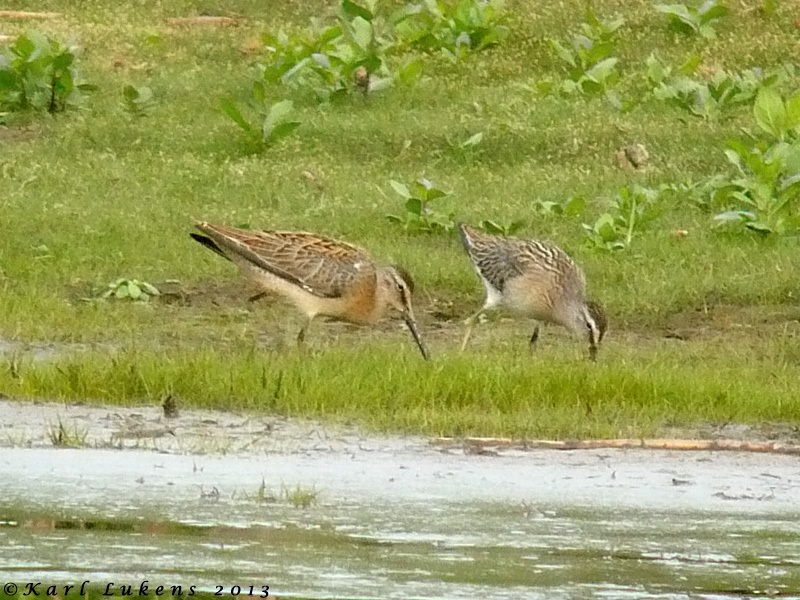 A sign of things to come - the first juvenile shorebirds from the Arctic are starting to pass our way now - here a couple of young Short-billed Dowitchers get their first taste of Cape May fare at The Meadows [photo by Karl Lukens]. Thousands of Bobolinks pass through Cape May every fall, but so many of them are just little blips flying high overhead. This individual chose to pose for our group at The Meadows on Monday and was much appreciated by all [photo by Hugh Simmons]. There's a definite air of anticipation around Cape May these days, borne by a number of different factors - a decided drop in night time temperatures (very welcome! ), the increasing appearance of some familiar faces not seen for a few months and a gradual increase in mysterious, night time seeps, chips and tweets. What does it all mean? 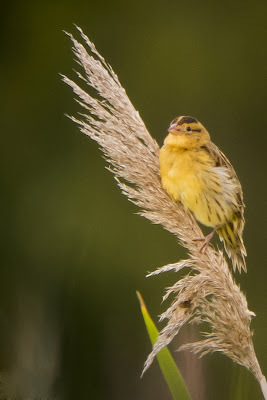 It means that mid-August is here - and so are the birds!! Before long we will be introducing you to this season's team of migration counters and interpretive naturalists; the Hawkwatch Platform is currently getting a facelift, courtesy of Cape May Point State Park staff and Higbee Dike promises to be awesome this year, having had several feet added to its height and providing a really fabulous panoramic view. The Morning Flight Project has already started for 2013, so do check out our Seasonal Research blog regularly and read the count highlights as they are posted. Hawkwatch and Seawatch counts will be added once those seasonal projects start too. The story so far? Well, all our boat trips are currently reporting growing numbers of shorebirds out in the backbays, fledgling Ospreys seem to be practicing their craft on nearly every pond in the area and our Higbee Beach walks are well under way now. Higbee Beach this morning provided some great early-season birding with Black-and-white, Blue-winged, Golden-winged, Hooded and Worm-eating Warblers, American Redstart and a few of those troublesome Empidonax flycatchers putting in an appearance. Eastern Kingbirds are building steadily in number, Blue-gray Gnatcatchers are on the move and juvenile Orchard Orioles and Indigo Buntings are working the field edges. The Morning Flight count on 15th also produced an early Magnolia Warbler and a very welcome Cerulean Warbler - always a very scarce bird here. Tern watching over the past week or so has been very rewarding; with some 2000+ terns currently feeding in the rips and resting on South Cape May Beach, it's been a tough task pulling out the goodies, but up to four Roseate Terns, two Sandwich Terns, two Caspian Terns, three Black Terns and three Gull-billed Terns have all been found and there's surely more to come. Other highlights at the point so far have included some good swallow passage (Tom Reed reported 550 Barn Swallows moving west in just five minutes on the morning of 10th), and a fly-over Upland Sandpiper, Red-headed Woodpecker and Dickcissel on 11th. Two Marbled Godwits flew over Stone Harbor Point on 13th and a few stalwart regulars remain in the area, including at least two Eurasian Collared Doves still on Whilldin Avenue at Cape May Point. One surprising report that came through recently was the sighting of a Spotted Sandpiper chick just south of the Cape May canal, certainly not a species we expect to find breeding here. Dragonfly numbers continue to impress this year and it seems that the whole county is drenched with Swamp Darners at the moment. While their numbers are generally not notable during much of the day, they are certainly difficult to miss in the evening when large numbers gather to vacuum up mosquitoes. Lately, the largest numbers I have been seeing have been in the streets close to the bayshore in Villas and Town Bank. Most migratory butterfly species have yet to put in a noticeable appearance, but a few Cloudless Sulphurs have been hanging around the Partridge-pea patches at Higbee Beach and Monarch sightings have just started to trickle in over the last three or four days. Time to get out into the field!! If there's one thing about bird identification that comes up more often than anything else on our regular Cape May walks it's this - don't rely on a single feature to identify a bird. You can, of course, pick up on a single feature to get you started - yellow legs on a shorebird, double wing bars on a warbler, streaks on a sparrow etc, but that should be your starting point, not your end game. On a recent walk, one participant was confused; we had told her that American Oystercatcher looks like it is carrying a carrot thanks to that long orange bill, then we told her the same thing for Royal Tern. If they both have this feature, she asked, then how was she to tell them apart? If you know your birds well, this might seem like a rather odd question, as you will know that the rest of these two birds is completely different. Yet it is not a silly question, for time and again I come across people who do try to identify a bird based on a single feature and this can so often lead to disaster! In the photos below, I offer up a couple of recent examples where relying on a single feature would have resulted in a wrong identification. Case number 1: Sandwich Tern is our only tern with a yellow-tipped, black bill. See that feature and you know that you have a Sandwich Tern. 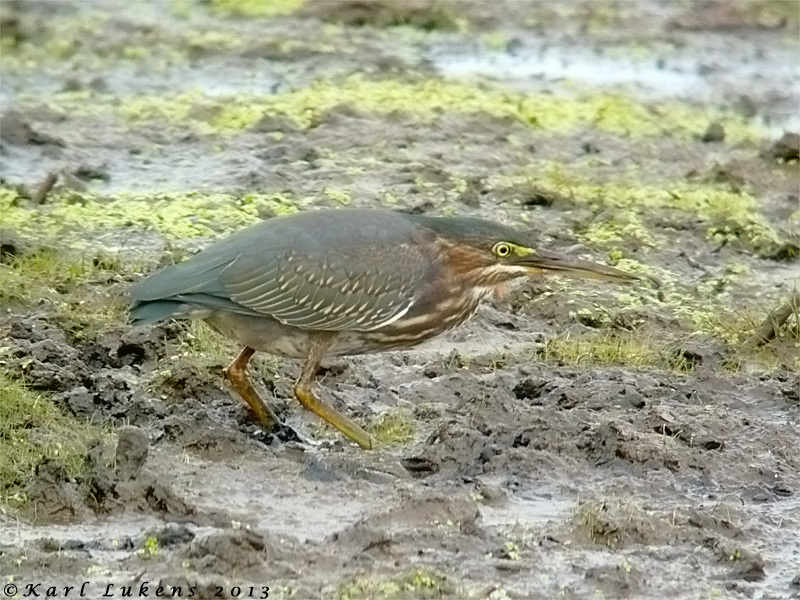 This bird was at Bunker Pond just this past few days [photo by Mike Crewe]. Also on the railing at Bunker Pond, another tern with a yellow-tipped, black bill. So another Sandwich Tern right? Nope, not this time... a quick check of the rest of the bird immediately reveals orange legs and a very strange head pattern for Sandwich Tern, with no sign of a crest. This is in fact a second calendar year Forster's Tern; such birds usually have all black bills, occasionally with a limited amount of orange at the base. However, birds bill are rather like our finger nails in that they continue to grow throughout their life. General wear and tear prevents the bill from becoming elongated and mishappen. The tip of the bill is often pale simply because the newly-grown section has not acquired any color pigment yet, so a pale tip to the bill is quite a ommon thing to see. Check this photo with the Sandwich Tern above and you will see differences in the size, shape and color of the amount of pale between the two birds. The moral here is - don't forget to check the whole bird [photo by Mike Crewe]. Case 2: A Roseate Tern on the railing at Bunker Pond. Easily told as a Roseate Tern by the all black bill and - remember that little trick I told you about in earlier posts? 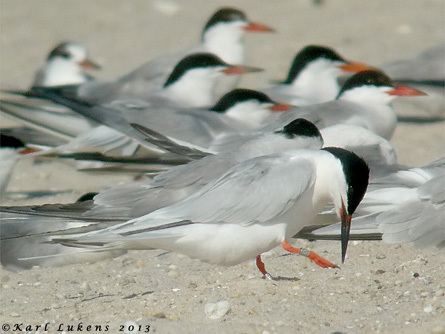 Roseate Terns have bands on both legs... [photo by Mike Crewe]. So what is this? Bright red base to the bill and no bands errrrrr, Common Tern? No, this is a Roseate Tern too! Again, you can use bill color (and even presence of bands if you like) to get you started, but always check the whole picture just in case. This is a Roseate Tern, photographed at the state park a few days ago. Roseate Terns are trapped and banded regularly as part of research projects into the species, but not every bird gets caught, so expect the odd one not to have bands. The amount of red on the bill is very variable in this species too, though I would say that this bird is pretty much at the reddest end of the range. A good guide here is the shape of the red patch on the bill. In Roseate Tern, the division between red and black forms a strong zigzag pattenr with usually much more red on the upper than on the lower mandible. In common and Forster's the division is more even [photo by Mike Crewe]. 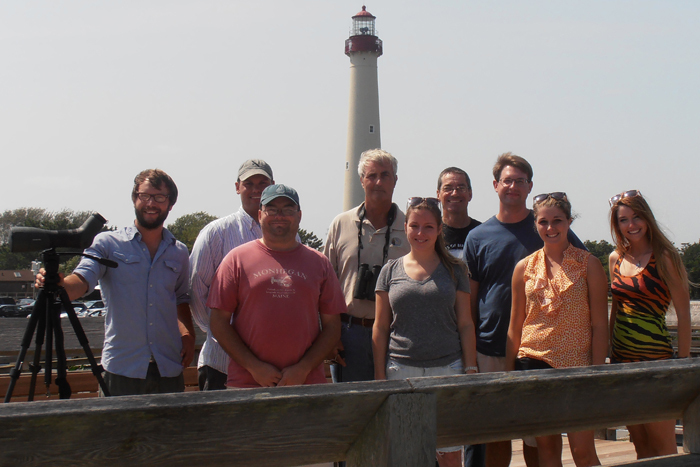 Now is a great time to be out looking at terns at Cape May. A Sandwich and up to four Roseate Terns have been hanging out at the point lately, along with a good number of Royal Terns and masses of Common and Forster's Terns. This morning came reports of two Caspian Terns joining the throng, while small numbers of Black Terns are now starting to appear too. The first American Redstart of the fall for my office window list right now tells me it really is time to be out in the field - see you out there!! Our Swarovski Optik-sponsored 2013 Morning Flight project at Higbee Dike doesn't officially start until August 15th, but that doesn't mean that the birds will wait until then! This year, Sam Galick returns to count for us again, which is great news since Sam is already getting out there and noticing some early migrants passing through. Perhaps most surprising so far was the count of 53 Yellow Warblers on the morning of July 30th, while there has been an interesting movement of Northern Waterthrushes going through already - typically I would expect such early-season birds to be Louisianas, but there has been the odd triple-figure count of Northerns by mid-August in some years, so this is not overly unexpected. Shorebird numbers have not been high yet, but there is certainly good diversity, with the likes of Whimbrel and Black-bellied Plover - even a Red Knot - joining larger numbers of Semipalmated and Least Sandpipers. And under the heading of 'if you don't go out you won't see anything', Sam's presence proved worthwhile with the discovery of a juvenile Bonaparte's Gull on August 6th at the ferry terminal - a sighting even six weeks later than this would be considered early! In previous posts, I have mentioned how digital photography is offering us new identification tools for dragonflies, simply by allowing us to photograph distant shapes and zoom in to see the detail; this practice is certainly paying dividends with birds too, and perhaps nowhere more so than at Higbee Dike, where fast-moving blips in the sky are being turned into identifiable photos of birds, even of species where very few flight shots taken naturally in the wild currently exist. Here's a few of the photos that Sam has sent me from this season so far. Test yourselves on the photos and see how you do! 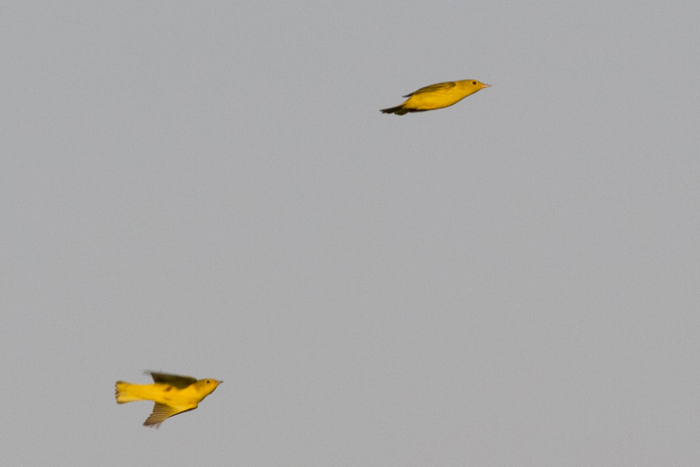 From top to bottom they are Yellow Warblers, Northern Waterthrush, Worm-eating Warbler, Prothonotary Warbler and Mourning Dove. A high ISO rating, coupled with the need to hand hold the camera and pan makes for grainier images than one would like, but I think that the results are remarkable. Look at the diagnostic yellow undertail of the Yellows, the Waterthrush's supercilium shape, the Worm-eating's overall plain appearance with dark eyeline and the Prothonotary's large bill - all good ID features. 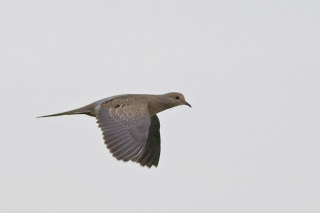 The Mourning Dove I like as it shows nicely the pale feather tips that produce a scaly pattern to juveniles at this time of year [photos by Sam Galick]. Once our Morning Flight Project begins officially, we shall be posting counts regularly on our Seasonal Research blog, which will also carry data from the Hawkwatch and Seawatch projects. This year we are grateful to Swarovski Optik for sponsoring all three of these important research programs. Seems like everyone has been tern watching this weekend, as numbers of several species of these birds have been steadily increasing this past few days. 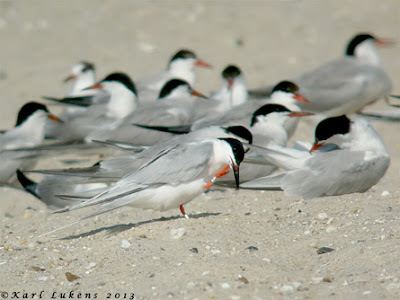 Up to two Roseate Terns and 10 or so Royal Terns have been hiding among the tern gatherings on the beach at Cape May Point State Park, where up to at least 1600 Common Terns have been estimated recently. The Roseates remain elusive but are best looked for either on the beach near the bunker, or on the railing on the south side of Bunker Pond. Gatherings of birds at Stone Harbor Point are also providing good birdwatching opportunities now, with flocks of Whimbrel stopping by, while Tom Magarian reported five Roseate Terns and around 400 Royal Terns there this evening. Adult Sanderlings - some still in full breeding dress with rich, rusty faces - are flocking to tidal beaches now and the first Parasitic Jaeger of the season was reported from the rips on 3rd. 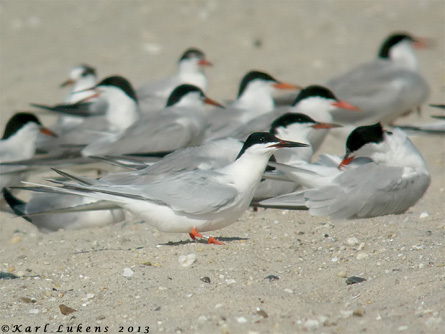 Karl Lukens sent me these shots of one of the Roseate Terns on the South Cape May Beach at the state park today. Roseates can lose themselves surprisingly well in a large flock of Common and Forster's Terns, but look carefully for a long, fine-pointed and mostly black bill, overall pale appearance and a diagnostic pale stripe along the top of the fold wing, produced by a white trailing edge to the flight feathers. Oh, and if all else fails, Roseates are being well-studied and you can usually reckon on any Roseate Tern that you find having bands on both legs - a great ID feature!! Last week saw the second, annual National Moth Week here in the US and CMBO was pleased to be a part of this great event for the second year. Insects have suffered from some pretty bad press over the years and, but for butterflies and dragonflies, most insect groups are still lumped here under the catch-all heading of 'bugs' and to most people bugs mean one thing - get the bug spray out! But times they are a-changing and an interest in moths in the US has gone hand in hand with the publication of a new Peterson Guide on the subject (available at our store of course!). In the UK, a National Moth Night scheme has been running annually since 1999 and the amount of interest and knowledge of moths generated from this scheme has been spectacular. In the county of Norfolk, where I lived before moving to the USA, over 1700 species of moths have not only been identified by local enthusiasts, they have also been photographed, mapped and recorded for posterity. Long-running databases such as these are vital in providing solid background knowledge on the status of our natural heritage, so that important planning decisions can be made accurately and with due thought and process. The current year has been relatively quiet for moths in our little corner of Cape May County and our catch for National Moth Week was much less than this time last year. With just two years of data, it is impossible to make much of this and my guess is that the wet and mild winter, followed by a wet spring, has had a temporarily negative effect on our moth populations. However, such natural events - if they turn out not to be a trend - often have short-term effects and populations should bounce back. If interest in moths and other insects continues to increase in the US, in the way it did in the past in many European countries, then this can only be a good thing for the environment - which means it is a good thing for the planet, which means it is a good thing for us!! Here's a sampler of some of the moth species we identified on our National Moth Week session last week. Note that all moths were released alive after study. Perhaps the classic idea of a moth - a grubby brown thing with little going for it! The Rustic Quaker is certainly uninspiring and was originally named a quaker for its austere appearance. This species is useful as a teaching tool however, as it clearly shows many of the wing features common to the majority of larger moths. This includes the positioning of the pale lines (often referred to as Antemedian and Postmedian lines) and the two circular marks on each forewing, known technically as the reniform (ie kidney-shaped) stigma and the orbicular stigma (rounded) [photo by Mike Crewe]. Common Looper is named after its caterpillar, which has a habit of forming loops with its body as it inches along. Many North American moths still await a useable English name and were originally named after their larval stages as these were recognized as pest species of agricultural crops or garden plants. This species is a member of a group known as the Plusias, most of which have extraordinary gold or silver blobs in the center of their forewings. Note also the long tufted hairs on the back which break up the moths outline and help it to escape detection from predators while at rest during the day [photo by Mike Crewe]. Though you may not know it, you will almost certainly have seen this species if you live in Eastern North America. This is the Isabelline Tiger, the moth that starts its life as a woolly bear caterpillar. Woolly bears vary in the amount of black versuses chestnut hair that they have and this is often taken as an indication of the hardness of the coming winter - sadly such old customs have no scientific foundation, but there can often be a long term trend in weather patterns that sees a certain type of winter following a certain type of summer. People who's lives depend on the outdoor world often pick up on these trends over time and the origins of such beliefs are always of interest [photo by Mike Crewe]. When you start getting into moths fully, you sooner or later have to decide whether you are going to take on the so-called Microlepidoptera. At just 4mm long, Homostinea curviliniella is a classic example of what is, quite frankly, a tedious little brown job! No-one has yet bothered to bless it with an English name, you won't find it in the new Peterson Guide and many people would probably lose the will to live before taking on the task of identifying it! However, all such things have a place in our world; this moth is in the Tineidae, a family of moths that mostly feed on dry remains and many started out as species that lived their lives feeding on the detritus in bird nests. Once Humans started settling into permanent homes, some species soon switched to munching our soft furnishings (after all, wool is just dead animal remains!) and became the moths that chewed holes in our carpets and clothing. Modern textiles and applications of moth repellents to materials has made these more or less a thing of the past and this little guy probably grew up in a bird nest and not in my CMBO T-shirts [photo by Mike Crewe]. A large and important family of moths are the tortrixes. The word tortrix means to twist, and these moths are named after the habits of their larvae, which twist up leaves to make feeding places that are safe from predators. This habit has resulted in many of them being known as leafrollers and this Sumacleaf Tortrix is typical of the group. Though small, many tortrix moths have intricate and interesting patterns [photo by Mike Crewe]. Tortrix moths come roughly in two forms - those that fold their wings tent-like (like the Sumac Tortrix above) and those that fold their wings flattened over the back. This Sulphur Sparganothis (the larva is known as Sparganothis Fruitworm) is typical of the flat-backed group and is an abundant species in Eastern North America. This is also a good example of a highly variable species and it seems that you never catch two that are quite alike, with many having a much more variegated look than this one [photo by Mike Crewe]. Micromoths come in an almost overwhelming amount of colors, shapes and forms. The Crambids and Pyralids form a large cluster of closely-related species which present an amazing array of variation. This Darker Moodna is in a group of Pyralids that rest with wings folded into a tube and many have attractive shades of mahogany and purplish brown on their wings [photo by Mike Crewe]. OK, so you can start by deciding whether you have a micromoth or a macromoth based on size... well, no, of course not, this is nature after all! This Common Spragueia is a so-called Macromoth, yet it is less than 10mm long. Though small, it is well worth seeking out as the colors and markings really are pretty amazing; it's a fairly common moth and its larvae feed on bindweeds [photo by Mike Crewe]. Many moth species are well-known for their cryptic appearance, an adaptation that allows them to successfully pass the day un-noticed by potential predators. The Juniper-twig Geometer is a classic example of a moth that readily passes itself off as a dead leaf. The strongly-hooked wing tips of this individual suggest that it is a female [photo by Mike Crewe]. Regular monitoring and recording of moths has demonstrated that many species move great distances as migrants, while others are local but still move around a surprising amount. The Waterlily Leafcutter (above) is one of an interesting group of Crambid moths that have aquatic larvae - the larvae feeding below water level on aquatic plants. Though tied to water for breeding, adults clearly move a lot in search of new breeding areas and in search of mates and this species is regular in our moth trap - though we have little or no suitable breeding habitat for it for at least a mile in any direction [photo by Mike Crewe]. This year's National Moth Week catch was a little quiet for us and there was little in the way of big and spectacular to post. However, we did catch a nice Ultronia Underwing. The underwings have cryptic forewings to keep them concealed during the day, but the hindwings are often brilliantly colored in red or orange. If investigated by a predator, the sudden appearance of this color when the wings are flicked open can be enough to startle the attacker and allow the moth to escape. In the past, the underwings were heavily collected purely for Human desire and some species have become much rarer than they once were. Thankfully we now live in times where 'collecting' for pleasure can be done with nothing more deadly than a digital camera. There is a wonderful natural symmetry about moths and it is a shame that the old Victorian tradition of pinning specimens in unnatural poses became so popular in the past [photo by Mike Crewe]. It's another year now until the next National Moth Week rolls around, but don't let that stop you from putting an outdoor light on in the evening, getting yourself a copy of the Peterson Guide to Moths and driving yourself crazy trying to identify the beasties that turn up. If you can't wait that long, don't forget that we often look at moths on our Sunday morning Belleplain Wildlife walks - so come aong and see what you have been missing! Some of this year's moth group get stuck into the egg cartons [photo by Megan Crewe]. Early August is a special time to be in South Jersey, for it's now that the Purple Martins start to wander from their breeding sites and meet up with each other at traditional gathering spots. These movements usually involve relatively short distances, as birds find each other, gather in small groups and begin to head to favored staging areas before they begin their migration in earnest. These gathering locations usually fulfil two major requirements for the birds; somewhere to feed and somewhere to sleep. Over the years, Purple Martins have settled on Mauricetown in Cumberland County as being a perfect location for them. The Maurice River provides extensive stands of Common Reed and Wild Rice for the birds to roost in, while the Delaware Bayshore provides plenty of insects to feed on. This coming Friday, August 2nd and Saturday, August 3rd, the place to be is the Maurice River bridge on Rt 670, between Mauricetown and Rt 47/347 to enjoy the amazing spectacle of thousands of Purple Martins gathering at their evening roost. Interpreters will be there from 7PM to dusk to help you enjoy this wonder of the natural world. If you are heading for the shore on Friday, this is a great way to break that drudge of a journey! Better still, why not join one of the great boat trips on the Bodacious, a trip that will take you along the Maurice River to get the very best of front-seat views of the Purple Martin Spectacular. For full information, click here. Treat yourself to front line enjoyment of an event that only takes place over one weekend each year - don't miss out!! Purple Martins are fledging from boxes and gourds all over the Northeast right now and well-fed juveniles are making their first tentative flights that will take them to traditional staging areas such as the Mauricetown roost in Cumberland County [photo by Mike Crewe]. The first indication you might get of martins starting to gather is when they begin to line up on utility wires on the edge of town. Though these lines of birds can be eyecatching, they are nothing when compared to the swirling spectacle of tens of thousands of birds preparing to bed down for the night in the reed beds on the Maurice River [photo by Mike Crewe]. Occasional sightings of single Roseate Terns continue to come from the Cape May Point beaches from time to time and a Black Tern was present there on 28th; July 31st also saw two Gull-billed Terns dropping in to Bunker Pond at the state park for a short while in the morning. The Meadows continues to hold good shorebird numbers, though water levels are getting very low and the rain currently falling outside the window will be a welcome top up! On July 27th, at least five Stilt Sandpipers were present at The Meadows. Small numbers of Little Blue and Green Herons, Glossy Ibises and Black-crowned Night Herons are arriving at the point and at least five Solitary Sandpipers passed over our Wednesday walk at the state park this week. July 22nd produced a count of 250+ Whimbrel at Stone Harbor Point and shorebird numbers at Brigantine continue to increase, with the odd White-rumped Sandpiper, Long-billed Dowitcher and Marbled Godwit being reported from there. 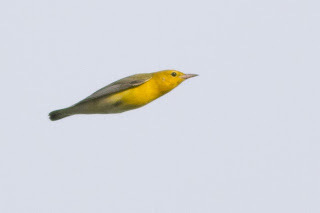 With just two weeks to go until our 2013 Morning Flight count starts, Sam Galick tells me that warblers are already on the move; Yellow Warblers are present at many locations around Cape May Point now and Sam noted 53 flying past Higbee Dike on the morning of July 30th. A few American Redstarts and both Northern and Louisiana Waterthrush have been noted from the dike too. Gull-billed Tern at Bunker Pond on July 31st. Now is a good time to be checking tern flocks for something a little different. Gull-billed Terns are rather different to most tern species in that they favor small frogs and dragonflies as food rather than fish. Look for them patrolling the edges of lakes, especially those with lilypads on, as they swoop to take food off vegetation or from the air rather than plunge-diving for fish [photo by Mike Crewe].